Group Therapy — Fairfax Mental Health & Wellness, Inc. In addition to our individual therapy and psychological testing services, we also provide group therapy specific to some very real issues that you may have experienced. Our groups are led by clinical psychologists with decades of experiecne between them. For more information on our current group therapy offerings, please click a link below or contact our office for more information. Let's face it, it's not easy being a kid these days. The stress and pressure of school on top of our every growing use of technology can severely hamper a child's social interactions. We're here to help. This group will focus on conversation skills, joining in, listening/attention, emotional awareness, anger management and avoiding bullying. The group occur each Tuesday will include children of all genders ages 7-11 and will be led by child psychologist, Dr. Emily Claus. If you have any questions or if you would like to participate, please click the button below or call our office at 703.896.7628. We've all been there. Being a teen can be one of the most difficult and trying times of your life, especially in Northern Virginia. Our group therapy sessions will be an open and caring environment for your teen to help develop conversation skills, emotional awareness, build self-esteem, and manage disappointment and peer pressure. 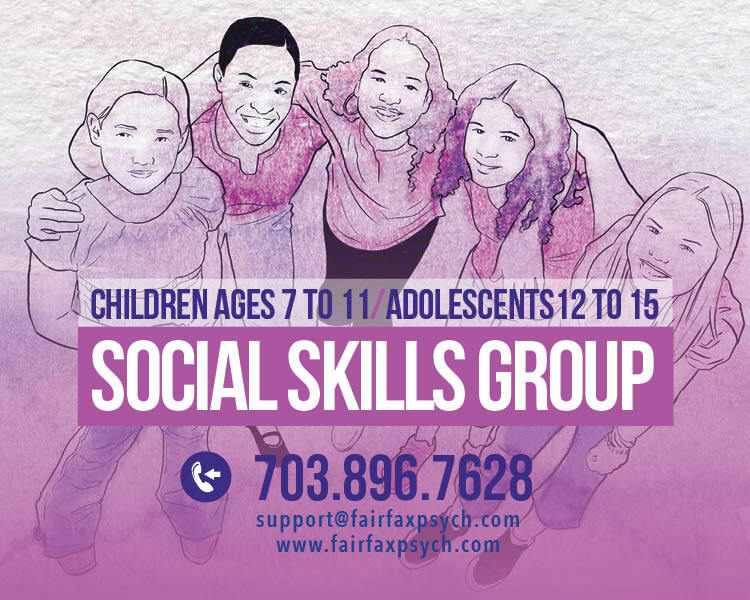 The group occur each Tuesday will include children of all genders ages 12-15 and will be led by child psychologist, Dr. Emily Claus. Every Monday, we will be hosting group therapy focused on survivors of sexual abuse and trauma. The group will be hosted by Dr. Jessica David who has over 15 years of experience in this area. This group will be open to anyone 18 and over suffering from abuse no matter when that abuse occurred.